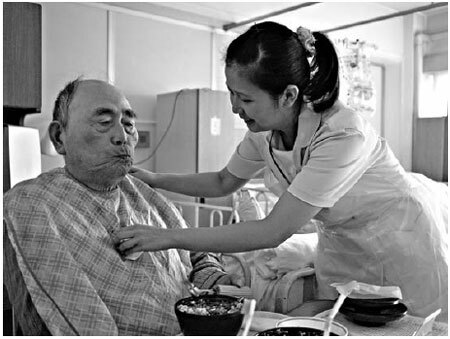 KASHIWA, Japan - Maria Fransiska, a young, hard-working nurse from Indonesia, is just the kind of worker Japan would seem to need to replenish its aging work force. But Ms. Fransiska, 26, is having to fight to stay. To extend her three-year stint at a hospital outside Tokyo, she must pass a standardized nursing exam administered in Japanese, a test so difficult that only 3 of the 600 nurses brought here from Indonesia and the Philippines since 2007 have passed. So Ms. Fransiska spends hours in Japanese language drills, on top of her day job at the hospital. "I think I have something to contribute here," Ms. Fransiska said. "If I could, I would stay here long-term, but it is not so easy." Despite facing an imminent labor shortage as its population ages, Japan has done little to open itself up to immigration. In fact, the government is doing the opposite, actively encouraging both foreign workers and foreign graduates of its universities and professional schools to return home. In 2009, the number of registered foreigners here fell for the first time in almost a half-century. Tokyo seems to have resigned itself to a demographic crisis that threatens to stunt the country's economic growth, hamper efforts to deal with its chronic budget deficits and bankrupt its social security system. The barriers to immigration to Japan are many. Restrictive immigration laws bar the country's struggling farms or workshops from access to foreign labor, driving some to abuse trainee programs for workers from developing countries, or hire illegal immigrants. Stringent qualification requirements shut out skilled foreign professionals, while a web of complex rules and procedures discourages entrepreneurs from setting up in Japan. Japan's population will fall by almost a third to 90 million within 50 years, according to government forecasts. By 2055, more than one in three Japanese will be over 65, as the working-age population falls by over a third to 52 million. Still, when a politician of the defeated Liberal Democratic Party unveiled a plan in 2008 calling for Japan to accept at least 10 million immigrants, opinion polls showed that a majority of Japanese were opposed. "The shrinking population is the biggest problem. The country is fighting for its survival," said Hidenori Sakanaka, director of the Japan Immigration Policy Institute, an independent research organization. "Despite everything, America manages to stay vibrant because it attracts people from all over the world," he said. "On the other hand, Japan is content to all but shut out people from overseas." Now, in a vicious cycle, Japan's economic woes, coupled with a lack of progress in immigration policy and lack of support for immigrants, are setting off an exodus of the precious few immigrants who have settled here. Akira Saito, 37, a Brazilian of Japanese descent who traveled to Toyota City 20 years ago from São Paulo, is one foreign worker ready to leave. The small auto maintenance outfit that Mr. Saito opened after a string of factory jobs is struggling, and the clothing store that employs his Brazilian wife, Tiemi, will soon close. Their three young children are among the local Brazilian school's few remaining pupils. For many of Mr. Saito's compatriots who lost their jobs in the fallout from the global economic crisis, there has been scant government support. Some in the community have taken money from a controversial government-sponsored program intended to encourage jobless migrant workers to go home. "I came to Japan for the opportunities," Mr. Saito said. "Lately, I feel there will be more opportunity back home." The government has done little to integrate its migrant populations. Children of foreigners are exempt from compulsory education, for example, while local schools that accept non-Japanese-speaking children receive almost no help in caring for their needs. Many immigrant children drop out, supporters say. "Japan does not build strong links between immigrants and the local community," said Hiroyuki Nomoto, who runs a school for immigrant children in Toyota City. The country is losing its allure even for fans of its cutting-edge technology, its pop culture and the seemingly endless business opportunities its developed consumer society appears to offer. "Visitors come to Tokyo and see such a high-tech, colorful city. They get this gleam in their eye, they say they want to move here," said Takara Swoopes Bullock, an American entrepreneur who has lived in Japan since 2005. "But setting up shop here is a completely different thing. Often, it just doesn't make sense, so people move on."